Home › Latest Promotions › 20% OFF EVERYTHING ON OUR ONLINE STORE! 20% OFF EVERYTHING ON OUR ONLINE STORE! Black & Friday are our two favourite things... Celebrate the holidays with 20% OFF EVERYTHING on our Online Store! Use Code: BLACKFRIDAY20. 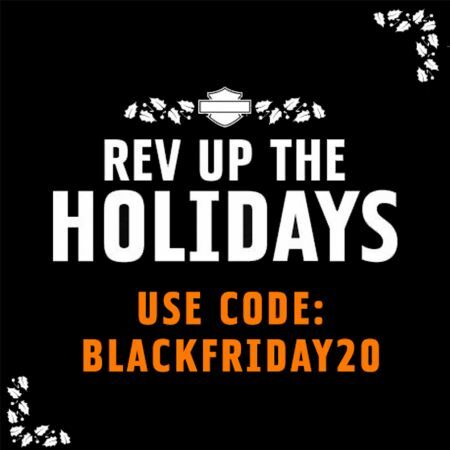 Starting at midnight on Friday 23rd November its your chance to grab some great Black Friday bargains on genuine Harley-Davidson® Clothing and Accessories. Go full throttle on their wishlist and rev up your holiday with this EXCLUSIVE OFFER that doesn't happen often!